The award-winning Cancer Survival Toolbox is a free audio program. It was created by leading cancer organizations to help people develop skills to better meet and understand the challenges of their illness. The program contains a set of basic skills and special topics. Each scenario is inspired by true stories of real cancer patients. The Cancer Survival Toolbox is for people at any point in their care. It is used by patients, health care professionals, and by individuals or in support group settings. Produced through a unique collaboration between the National Coalition for Cancer Survivorship (NCCS), the Oncology Nursing Society (ONS), the Association of Oncology Social Workers (AOSW), and the National Association of Social Workers (NASW), with a grant from Genentech, Inc., the Toolbox encourages people with cancer and their caregivers to take a more active role in their care. Listed below are the separate programs which make up the Cancer Survival Toolbox. Each page has a player where you can listen to the full program. 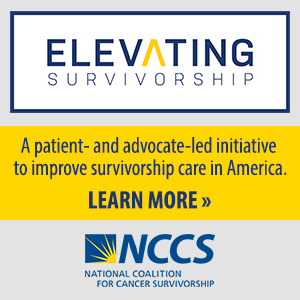 The full Cancer Survival Toolbox can also be downloaded for FREE in the NCCS store. All programs of the Cancer Survival Toolbox are available for free as a podcast on iTunes.